Crunchy, salty, yummy tortilla chips. Everybody loves a good nacho tortilla chip and dip right? But what happens when you realize that all the store bought chips are full of not-so-good stuff like canola oil or a million grams of salt, or a pound of sugar or some other crazy-hard-to-pronounce ingredient?? Ah! You slightly panic for five seconds and then you learn how to make your own oil free homemade tortilla chips because we need nachos in our lives, and guac needs chips. Plus, making your own tortilla chips is funner, cooler, anddd you don't have to deal with a huge bag of left over chips that go soggy three days after opening. Making your own tortilla chips is super easy... and I'm going to break it down for you so that it is even easier and you feel motivated to give this version a try. Store bought oil free tortillas. Whole Foods 365 brand has corn tortillas in the freezer aisle that only contains two ingredients - corn and lime. You can also use Engine 2 Plant Strong Oil free flour tortillas. Any tortillas will work but try to choose a brand that has clean ingredients. A coat of lime, a sprinkle of salt and a dash of pepper, cayenne and paprika. I give measurements below as an estimate, but honestly I usually wing this part. I just give each spice a shake and make sure that all chips have been coated as evenly as possible. An oven - so you can roast the chips for 20 minutes. That's it. How simple is that!? Lately I've been making our tortilla chips using corn tortillas - more specifically, the Whole Foods 365 brand. You can usually find these tortillas in the frozen food aisle. I'm loving these because they contain just two ingredients - corn and lime. That's it. Nothing else. Always check your ingredients to make sure there isn't anything hidden in there that you might not want to be eating. I find that corn tortillas make a more authentic corn tortilla chip, obviously. However, if for some reason you are avoiding corn, or maybe can't find these clean corn tortillas near your home - you can use flour tortillas. My go-to flour tortillas are usually the Engine 2 Plant Strong brand because they don't contain oil and are usually made with good-for-you sprouted grains. Flour tortillas make really good chips as well, but I find that you have to bake them a little longer than the corn variety at times. Remember if you want to stick with gluten free, make sure to choose gluten free tortillas. 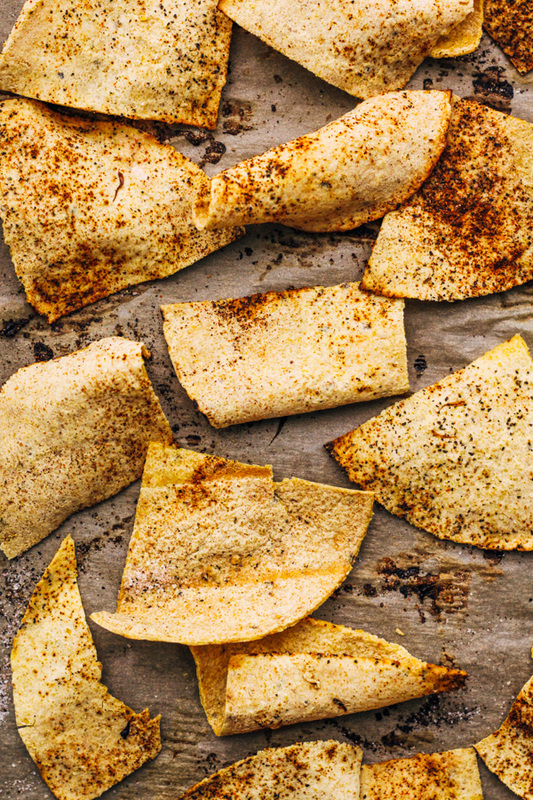 Are you excited to make your own homemade tortilla chips in the oven from now on? Tell me below what your thoughts are. Want to see more vegan savory recipes? Check out these oven baked oil free fries with avo tahini dip, or maybe you're in the mood for oil free vegan kale pesto stuffed mushrooms! 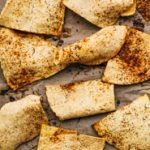 A super easy step-by-step guide on how to make homemade tortilla chips in the oven using corn (or flour) tortillas! 1 package (or 2 depending on how many chips you want) of oil free tortillas. I usually use the Whole Foods 365 Corn Tortilla brand or any of the Engine 2 Oil free flour tortillas. Preheat oven to 350F (176 C) Cut your round tortillas into 4 triangular pieces (see pictures if needed). You’re going to cut it in half right down the middle, and then cut the halves into halves. You’ll be left with 4 triangular pieces per tortilla. NOTE: if you are using large flour tortillas, you’ll probably have to cut them into more pieces. Place all the cut pieces on a baking sheet (preferably covered in parchment paper but aluminum foil works too), and sprinkle the lime juice over all chips making sure they all get coated. Go ahead and sprinkle the salt, pepper, cayenne, and paprika if you are using it. Bake the chips at 350F (176 C) for 20 to 25 minutes. Please keep an eye on your chips the first time around because every oven is different and yours might be ready within 20 minutes, while it may take someone else another 10 minutes. Chips are ready once they are slightly golden and crispy. I find that one package of 12 small corn tortillas makes enough chips for 2 people. Looks so delicious! I love corn tortilla chips and it goes perfectly with guac! So good! Have you ever made coconut flour tortilla chips? I have been obsessing over that recently! No I’ve never made coconut flour tortilla chips but you are inspiring me to create some!! How did they taste?! Can you taste the coconut or are they salty/savory? !